Council workers have been warned away from their office attic after 150 rare bats set up home there. 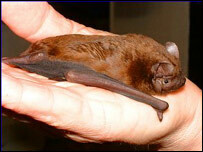 The Noctule bats have been roosting in Cambridgeshire County Council's education centre's attic since March. The flying mammals, which are protected under the Wildlife and Countryside Act, can live for up to 12 years and usually roost in colonies of 20-30 in trees. A spokesman for the council said special measures were in place to ensure their stay was comfortable. The council has put up special signs around the building warning workers to stay out of the attic. John Peacey, the council's head of facilities management, said: "We are delighted that these delightful creatures have made their home in one of our buildings and we will do everything possible to ensure they are not disturbed." The sandy-coloured mammals are about seven centimetres long with a wingspan of approximately 35 to 45 centimetres. The colony, which feeds mainly on beetles, moths and flies, is thought to be the largest gathering of the species anywhere in Britain.